Tobias came to North Shore Animal League America as a kitten when his owners could no longer afford to keep him. 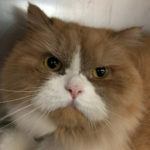 Here, at our Pet Health Centers, the friendly Persian was found to have repetitive urinary blockages and underwent several surgeries to ease the problem. Thanks to subsequent emergency surgery, Tobias’ ailments lessened over time. He may still be prone to blockages and infections in the future and must be regularly monitored. Because of you he has a fresh chance to live the life he was always meant to have. Thank you! Your support of Animal League America’s Pet Sponsorship Program will ensure that Tobias and all the Sponsor animals receive the love and care they need to be as happy and healthy as possible.